Waterfall walks, Country Parks, the Wales Coast Path, seafront promenades and glorious countryside can all be enjoyed whilst walking in and around Neath Port Talbot. 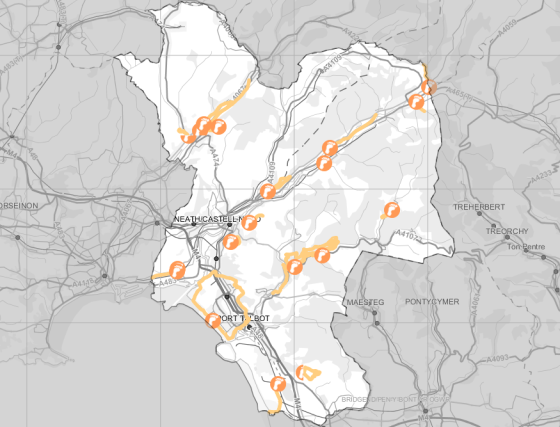 To make it easier to find the best route for each individual's needs, an interactive map has been developed to bring Neath Port Talbot's routes in to one easy, searchable location. Click on the map below to explore the walks. We also have an interactive cycling map showing our Cycle Routes in more detail. The map also features short videos of sections of the routes to give you an idea of what they look like. The Wales Coast Path (WCP) is a very important part of the heritage of Wales. In Neath Port Talbot we are fortunate that the WCP passes through a rich diversity of landscapes, full of interesting features. Due to the geography of our County Borough, and the urban nature of our coastal belt, two sections of Coast Path have been created through Neath Port Talbot. Although quite a short section of the All Wales Coast Path, there is much interest and variety along the two routes, offering wildlife, seaside cafes, history and striking views. Both sections, although geographically very near, are very different in character, difficulty and in their features of interest. N.B. Due to the closure of Newbridge Road Bridge on safety grounds, there is a temporary diversion in place on the Wales Coast Path near Newbridge Road, at Aberavon, Port Talbot. See map below for further details. For any more information, please visit the official Wales Coast Path website. The broad coastal belt that comprises the settlements of Margam, Port Talbot, Aberafan and Sandfields, is abruptly interrupted by the soaring mountains of the South Wales Coalfields. These are deeply dissected by the Afan and Neath rivers. It is this area which the upland route for the coast path traverses. Along this 7 mile route, there are many superb views across the Bristol Channel, and many interesting relics along the way. Not least the ruins of Chapel of St. Mary, known locally as Capel Mair, on the hill above the Cistercian abbey of Margam. All in all, the closer you look on this walk the more gems are revealed. There are a number of walking groups within the area, and details of these can be found on NPT's Physical Activity & Sport Service website. The walks themselves range in intensity, from lower level social paths, to more challenging mountain routes. The groups all have qualified walk leaders who provide a safety element to all group activities. The groups are very supportive, offering plenty of encouragement and are always looking for new members. There are a number of documents available that relate to Walking and the environment around you. You can also access more information on Cycling routes and Wildlife Trails in our Leisure, Parks and Cultures pages. There are also details on Countryside Access.